Your favorite grappler will laugh out loud when he sees the brunette boy wrestler personalized Christmas ornament in its match-winning pose. He'll consider this a special keepsake of his wrestling career because our lettering artists will add his name and the year - hand painted in a font more stylish than the one shown for clarity. 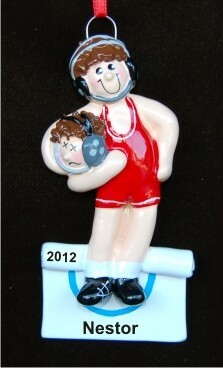 The results are personalized wrestling gifts of wonderful sentiment and lasting personal value. These wrestling ornaments personalized by hand are perfect for displaying on the tree, in his room or hanging from his gear bag. Show your support for his hard work and success with a fun and manly ornament that arrives in our handsome velvet drawstring bag.